Click image to see more of the new application. 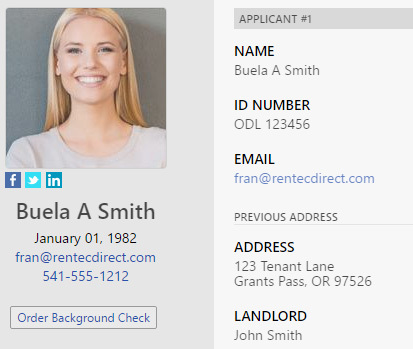 A new update to Rentec Direct’s rental applications include applicant photos and links to social media accounts. 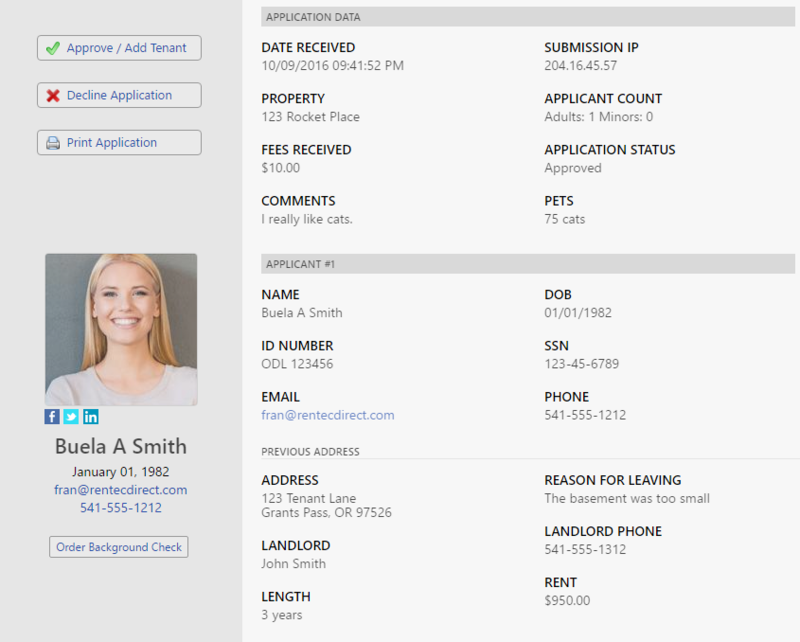 A couple weeks back Rentec released an update to the Tenant Page to show tenant pictures and social networking data. One of the first requests following its release was to also include this data on rental applications. The good news was we were already working on it and now we’re pleased to announce that that rental applicant photos and social data is now available! While the development team was adding social image data to the application, we decided it was time to modernize the application’s design so it’s easier to read and more appealing to the eyes. Nothing has changed for your tenants. The mobile friendly rental application has remained unchanged. Your view of the application is now more modern, organized, and easier to read. The application links to their social media profiles if they’ve set them public – simply click on the Facebook, Twitter, or LinkedIn icons below the applicant’s photo. 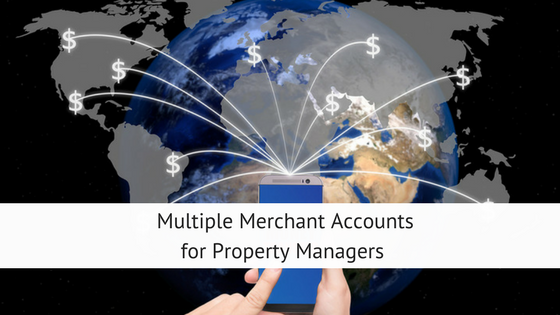 A quick screening button to instantly order background reports including credit, criminal, and eviction search. As with the tenant social data, you can disable this feature within the advanced settings tab if you don’t want the pictures or social links. This new tool gives landlords and property managers additional information to screen their renters by providing one less step to access public information. The social links will only work if the tenant has made his social media profiles public and accessible to anyone on the Internet, therefore avoiding any potential arguments against violating a renter’s privacy. Remember that all landlords and housing providers must follow Federal Fair Housing Guidelines and avoid housing discrimination based on a protected class. Suggestion: When uploading files to the File Library, it would be helpful if we could change the name of that file once it has been downloaded. That’s an excellent suggestion! If it’s not already, we’ll add that as a feature request to the file manager. Suggestion: Please change the applications back they way they were. The new one is much too hard to read. The lay out is confusing, hard to read and there is no flow, therefore it takes our staff longer to process the applications. The text is too light and too small on the applicants answers. It is very hard to see at a glance if they have left out information.When printing out it says Previous address, not current address. These are just a few of the problems we see with the new layout. Thank you for the comment. We’re underway modifying the wording on the previous/current address right now so those will be corrected soon. I’ll also go in and look at the other layout suggestions you have too. Please change it back until the bugs are worked out, I cannot print the application entirely, which means I cannot print my clause that gives me permission to talk to previous landlords, employers, or references. This is hindering my business, and I am now having to have everyone actually come in to the office for applications. This is the first we have heard of that. Would you mind sending in a copy of your printout to support@rentecdirect.com so we can look at the issue you are experiencing? Emily, can you check if the printing issue you experienced is fixed. We did notice that the margins were a little tight for some printers and we modified the system to accommodate those printers. We just discovered a bug that is present in some older versions of IE (those installed on Windows 7 or older systems). The older version of IE wasn’t printing the full page. We’ve implemented a workaround, but there’s still a side effect of IE printing things significantly smaller than they should. We added a notice to the top of the applications when printed to that effect. Even though we’ve published a fix, we recommend using Google’s Chrome browser instead as it does a much better job printing since it has full modern font support that the old version of IE you are currently using does not. I am also having the same issue with printing out applications. It’s not showing all of the information. It cuts out before the questions start. Hi Amber, I just sent you an email requesting a bit more information on the issue to help us diagnose it. I’m still new to Rentec Direct and I’m really loving it so far. I did have a question about the applications. Is it possible to print them out in case I have a tenant that is not good with computers and doesn’t really have any help with them? Hi Leona, The electronic application is online only, so it doesn’t print out very well. But here’s a link to a generic word document application which you could modify and use for anyone who needs a paper application. Is Rentec still taking 5% of the application fees? Tip: You can configure the application fee to the tenants to include your processing costs too by just increasing the application fee about a dollar.